Having lived in Florida the past 36 years, I’ve noticed a continuing growing presence of various vining plants including wild grape, air potato, poison ivy and poison oak, plus several ornamental vines including honeysuckle and various species of jasmine; overpowering our native vegetation much like kudzu vines have done up north. I was amazed at how fast these vines have spread, yet little if anything has/is being done to control their invasiveness. I’m afraid that if allowed to continue their uncontrolled and rampant spread, will kill off much our outlying wooded areas, by covering full grown trees/shrubs with their foliage, which greatly reduces the ability of the affected plants to carry on necessary photosynthesis in order to survive. So what can we do? The first step is to locate the sources of these vines. Next, sever them at ground level and then you may try pulling the vines out of your trees/shrubs. Sometimes this may be impossible, if not futile, and oft times branches may be broken. But you needn’t worry as long as the runners have been severed, they will eventually die and fall off your trees. Many people I know have applied some of the readily available brush control herbicides to kill these plants. Unfortunately, they didn’t always completely kill the vines and would damage the plants they were trying to save. I suggest that where you severed the base of the vines, apply several coats of the brush killer over the open wound with a 1″ sponge-type paint brush. This is much safer and usually produces better results; sometimes though repeated applications may be needed, especially on large, well established vines. A word of caution – the best time to control these pesky vines is in the spring as new growth emerges on the vines. Waiting to treat later may result in the vines developing seeds that can spread the following year. As with all pesticides, wear proper protective equipment, disposable rubber gloves in particular to avoid contact not only with the pesticide, but sap from the vines, which can cause serious skin irritation. Let me know if you have had a problem with these vines and your suggestions for ridding them. 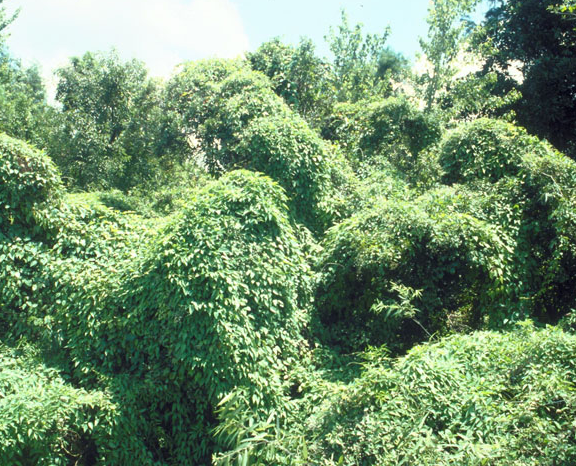 This entry was posted in Central Florida tree pests, Invasive vines, Plant Knowledge, Plant Pests, Uncategorized and tagged Invasive vines florida. Bookmark the permalink.